Small Spaces Deserve Love Too! When our friends at Signature Hardware reached out to collaborate on a project together, we jumped at the opportunity. We LOVE Signature Hardware. We not only recommend their projects to our clients for their homes, but I use them in my own home & love them. Our entire master bathroom is filled with Signature Hardware plumbing. When they reached out to collaborate, my powder bathroom was the first space that came to mind. This last month, we’ve shared how we transformed our house over the past 5 years here on the blog. Our budget didn’t allow for us to do anything to the powder bathroom during our initial renovation, so it’s been a place that I’ve wanted to update for a while, but it’s just taken a backseat because life. As you can see, there were travertine floors, dated wallpaper & older more formal dated plumbing—totally not our style. I wanted this powder, that everyone uses, to match the rest of the house—light, bright & airy. I loved the beadboard that was in the space, but thought that adding a shiplap would tie in with other areas of our house. Adding a new updated wallpaper was a no brainer because all powder baths should be a fun. Now I didn’t go too crazy because I’m scared to commit to anything too bold, but I loved this Pergola wallpaper from Anthropologie. Those were the first two things I decided on before heading over to Signature Hardware to find just the right vanity & fixtures for the bathroom. Signature Hardware has some of the best options in plumbing fixtures at some of the best prices. 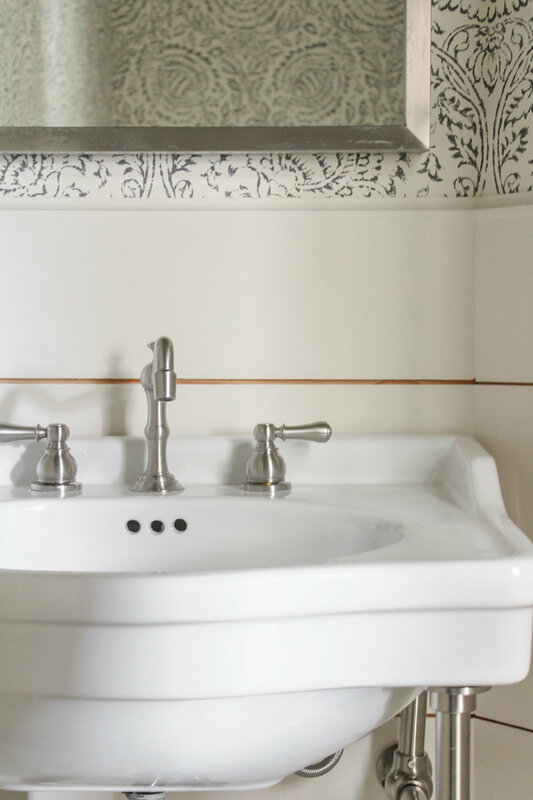 There were so many options that I wanted to use in our bathroom, but my simple & classic heart stopped when I saw the Sierra Console Sink & I kept my fingers crossed that it would fit in this tight space. Once I saw that the sink would fit, I looked no longer because I knew it was perfect for this bathroom. The Stella Widespread Faucet has a vintage feel to it. It was the perfect choice to pair with this sink. I wanted a really simple mirror in the room because the wallpaper has so much movement in it. The Leona Stainless Steel Mirror was a no brainer because of the clean lines & the perfect size. The last thing we needed from Signature Hardware was a toilet paper holder. The only thing that was necessary for the TP holder in my house was that it’s easy for my kid’s to be able to use & replace the roll. :) Who knew there were so many options for TP holders? But Signature Hardware did not disappoint & I love the Vintage Euro Holder that I got for this bathroom. It’s beautiful & simple. One of my favorite parts of designing this bathroom was having our followers on Instagram vote for the flooring for the bathroom. I loved seeing what our followers loved. It was a tough choice but the marble hexagon won out. I wish I could invite yall over to see the finished bathroom for yourself. You wouldn’t believe how these changes have made this tiny bathroom feel bigger. Yall tell me, what’s your favorite part of this remodel?